Stereotypically men crave more salty snacks and women crave sweet snacks. Which serves to confirm my theory that I think more like a dude when it comes to eating habits (not to mention other areas of life). Since trying to fight the february flab I’ve tried to be more conscious about eating fruits and veggies and adding strength training to doing yoga & walking. I am always amazed at how quickly the body begins to transform when you add lifting weights into the routine! Happily, the muffin stuffin’ has decreased from code red to code orange in just two weeks of being more aware of what I was eating & spending some time doing workouts from exercisetv.tv. Wait, I think code orange is terrorist attack, or is it missing child? There aren’t any missing children or terrorists in my stomach to clear things up. 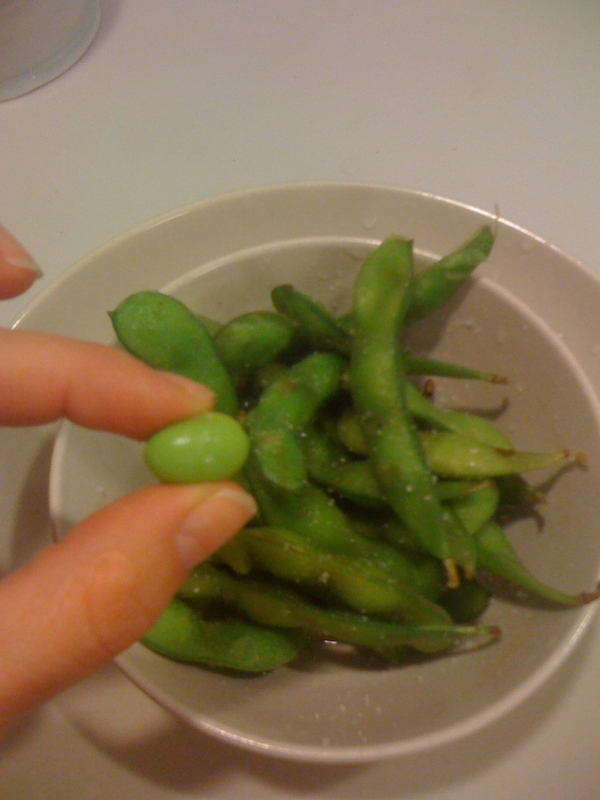 Lately, I’ve been eating edamame for one of my snacks during the day. And actually I’m snacking on them right now as I type this post! These have been a great way to get a serving of veggies & hit the salty craving. These fill me up, satisfy my salty snack craving- are high protein and fiber & low in carbs. Plus they’re easy to cook in the microwave and are fun to eat sprinkled with a little sea salt. It’s a little like the vegetable alternative of eating sunflower seeds- popping them into your mouth from the pods yet tasting the salt that has been sprinkled on the outside. "me & jenny, we's like peas & carrots"
What are ways you work fruits & veggies into your day? Have you found any good salty or sweet snacks that are still relatively healthy? 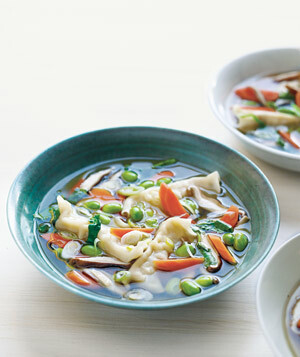 Real Simple just featured a soup including edamame & yummy asian dumplings that I’ve been wanting to try. Here’s the link for the recipe if you’re feel the urge to try some edamame and want to incorporate them into some other recipes. ← what gets in the way of your happiness? Jess, Mark and I are doing a Daniel Fast right now, and my favorite snack discovery from it has been apples dipped in almond butter. 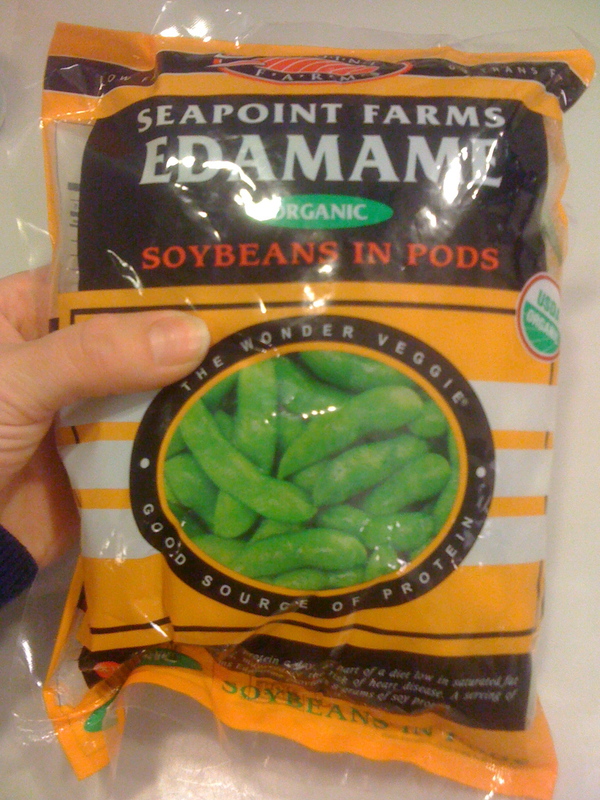 I’ve wanted to try edamame–how exactly do you fix it in the microwave? there are instructions on the package- but basically you put a little water in with the frozen pods, microwave for 3-4 minutes, let them sit for one and then- eat! what is the Daniel Fast? For our Daniel Fast we are eating only fruits, vegetables, nuts and beans, whole grains, honey and Ezekiel bread. So, no animal products, no sweeteners other than honey, no leavened breads other than the Ezekiel bread, and nothing to drink but water. There are variations: the honey and Ezekiel bread aren’t allowed on the more strict DF, and I know of some who don’t even do any grains at all. We started it with Lent, but are only doing it for 10 days. I’ve thought about doing the Strive for Five since you told me about it last fall when you were in Cleveland, and this fast is definitely helping me out with that–I hope I can at least keep that up when the fast is over. anyway, looking forward to seeing you & the rubes tomorrow.